The Indian Samosa needs no introduction. 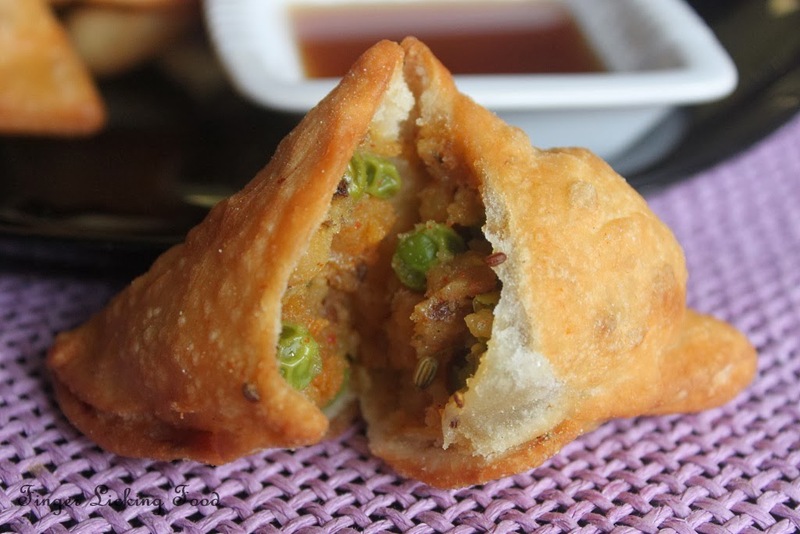 Crispy pockets of spiced fillings served up with a zesty mint chutney and a sweet tamarind chutney. Dunk it, drizzle on it or just eat it the way it is, it makes for a very tasty snack. It is a popular street food and there are more ways to make it than there are places that sell it all over the country. I figured I’d start with the most common filling in a samosa. 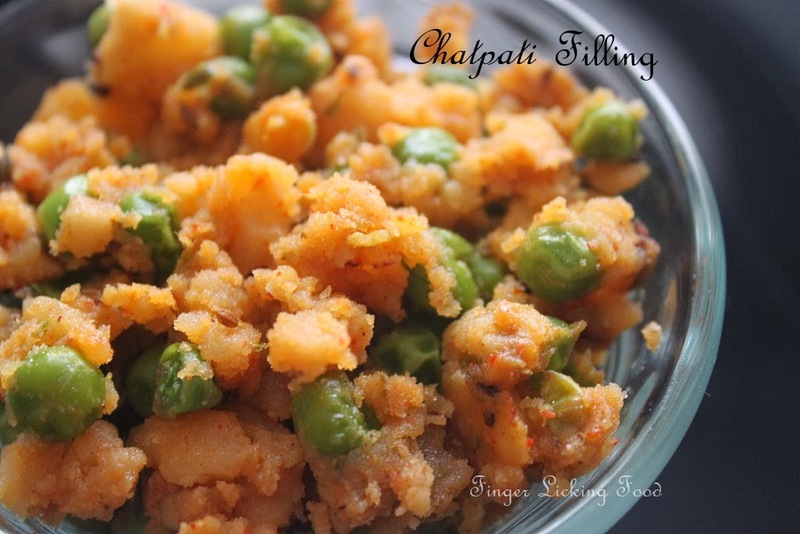 Potatoes and peas flavored with a few tongue tickling spices. Combine all ingredients in a wide bowl. Add ½ cup water first and then add a teaspoon at a time as needed to make a soft dough. It should not be sticky and should be easily shaped into a ball. Cover and allow to rest for 1 hour. This resting period is important to help the dough relax and make it more pliable. Meanwhile prepare the filling. Peel the potatoes, lightly mash and set aside. Heat oil in a pan. Add the cumin and fennel seeds. When it begins to splutter add the green chili paste and sauté for a few seconds. Now add the mashed potatoes and peas. Add the remaining ingredients (all the spice powders), season with salt and combine well. Cook for 3-5 minutes. Turn off heat and let cool. The filling options are endless. Any dry filling can be used, sweet or savory. 1. Knead the dough for a minute. Divide into 7-8 balls of dough. Flatten each ball and roll lengthwise. The key is to roll it thin so the samosas turn out crisp but thick enough to hold the filling in. Cut the rolled piece into half using a sharp knife. 2. Wet the edges of a piece all around using a damp finger. With a quick twist of your hand attach the ends to form a cone. I will be honest here, this takes some practice. I had to do it at least a dozen times to get it right. 3. With the sealed edge towards you, hold the cone between your fingers so it’s easy to fill. Place about 1-2 tbsp of the prepared Potato-Peas mixture and compress lightly. 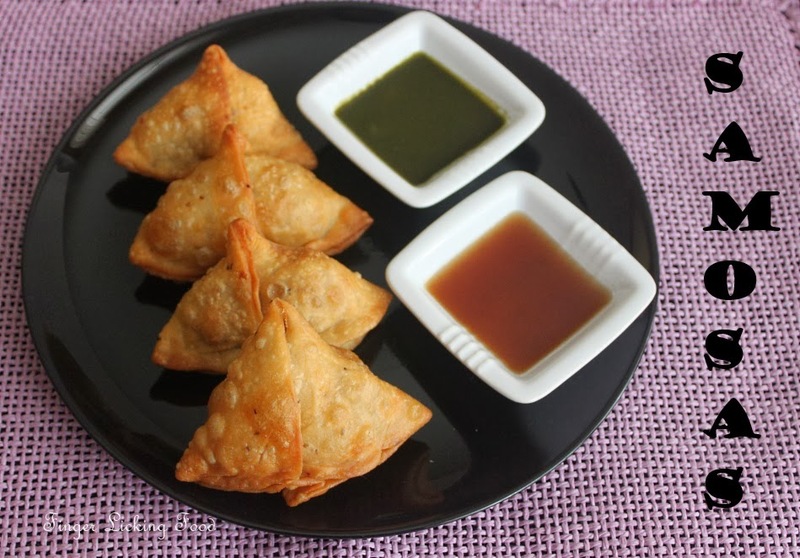 The more evenly you fill the better the shape of the samosa. 4. Slightly pinch the top of the dough. 5. Fold over the filling to create a seal. Gently press the edges together and lightly stretch it to create a ledge for the samosa to 'sit' on. The cone seal and this seal essentially form the ‘back bone’ of a samosa. 6. 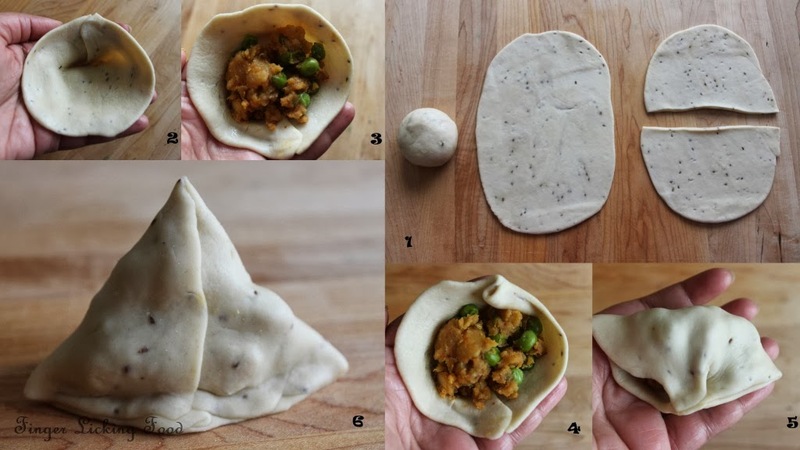 You now have a perfectly shaped samosa. Don’t fret if it doesn’t turn out right the first time. Like I said before it takes some practice so do it over and over until you get it right. If you are obsessed like me about a perfectly shaped samosa that is. It will taste good no matter how it looks. Heat about 2 inches of oil in a deep pan for frying the samosas. 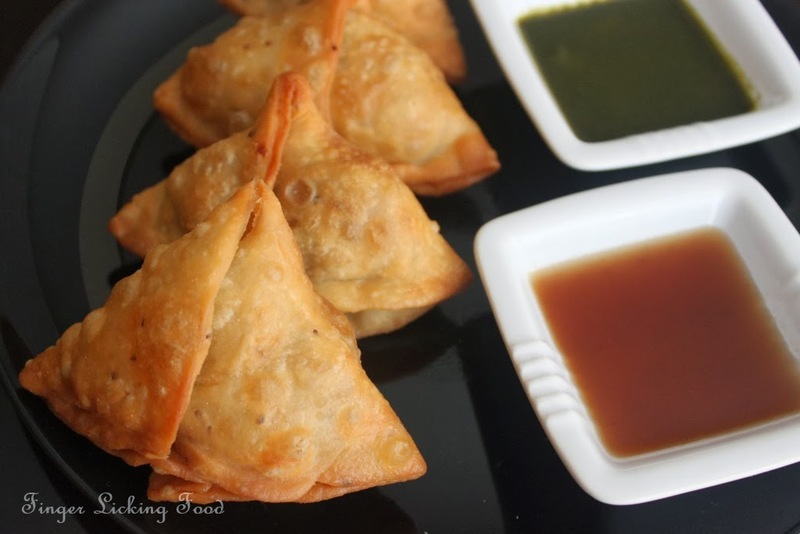 The oil should be medium hot so the samosas cook slowly and all the way through. Fry the samosas until golden brown. Remove and drain on paper towels. Serve hot with mint chutney, tamarind chutney and/or ketchup. The samosas look great, especially the wrap, crispy and just right.